Our in-house Bobcat Rental in Miami is a smart way to avoid scheduling conflicts while getting the most bang for your buck. XS Trash specializes in debris removal and hauling, with extra services for convenience and same-say service often available. Leaving heavy and dangerous trash items and debris laying around can lead to a serious hazard, especially when there are passerby around. 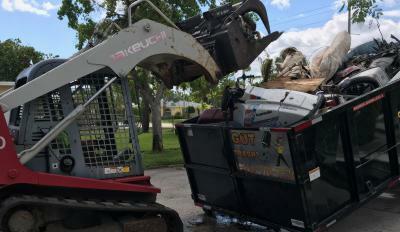 Our Bobcat rental in Miami can be a smart and affordable method for speeding up the cleanup process for a safer work site. Always aiming for 100% customer satisfaction, we are proud to deliver special recycling for eligible items and price matching abilities to help you get the most affordable and reliable service. Fees will include labor and dump fees, too, so that you won't have to worry about hidden costs surprising you. You will only be surprised by our friendly and highly skilled operators aboard your Bobcat rental in Miami.